Tim took his first dance class at the age of 12. He attended college at the Richard Stockton College of New Jersey where he received a Bachelor of Arts degree in Theater Arts. At Stockton, Tim worked on over thirty productions in all capacities, including actor, dancer, director, designer, choreographer, and producer. While in college, Tim danced with the Philadelphia based jazz company Monarch. He also trained and apprenticed with the Atlantic Contemporary Ballet Theatre, where he danced many professional parts in such ballets as, Sleeping Beauty, Nutcracker, Carnival of the Animals, Vision’s, and Etudes. Upon graduation at Stockton, Tim was hired as a production cast dancer for Celebrity Cruises aboard the ship Horizon. After sailing on the Horizon, he went on to sail on the Celebrity Millennium, Infinity, and two contracts aboard the Constellation. With Celebrity, Tim performed all over the world, including Russia, Scandinavia, Argentina, Spain, Alaska, and Brazil. While sailing, Tim became the choreographer and dance captain for singer/musician Perry Grant and his one-man show. Between performing on the seas, Tim came back to the states, and joined the Atlantic City Ballet as a company member. With ACB, Tim performed in several ballets including new works, originating the roles of Demetrius in Midsummer’s Night Dream and Van Helsing in Dracula. During this time, Tim also started attending graduate classes at Temple University where he studied not only modern dance technique but also Martha Graham technique with former Graham Company member Kun-Ya Lee, Dance Improvisation with Merian Soto, and Choreography with former Limon Company Principal Dancer, Anne Vachon. While at Temple, he studied at one of Philadelphia’s most renowned modern dance companies, Koresh, where he studied with Roni Koresh, Melissa Rector and many members of Pennsylvania Ballet. Tim has also performed with Figments Dance Ensemble, a New York City based company that brings modern dance into elementary schools. Besides company work, Tim has performed in many industrials in Philadelphia including performing as a back up dancer for 80’s pop star Deborah Gibson. In June of 2010, Tim joined In-Sight Dance Company, a Queens based contemporary ballet company as a company member and has danced in three of their ballets and also choreographed the pieces Rewind and Right Angles for the Company. Tim had his first Off-Broadway experience in February 2011, performing in Maria Colaco Dance's Eye Candy. Also in February, Tim appeared in Brice Mousset’s Gala at Manhattan Movement and Arts, performing in his piece Temptation. He joined Becky Radway Dance Projects to perform in her piece Roam at Triskelion Arts and the 92nd Street Y Theater. Tim danced for choreographer Diego Funes and his company in the PeriDance showcase. Tim also appears in artist Dan McCarthy’s video Two Left Feet and J. Michael Reeds’ video Unwell. Since opening TLC, Tim has also had the pleasure of dancing in both DIVAS DO AC and DISCO LADY with MAXINE NIGHTINGALE at Resorts Casino Hotel in Atlantic City, New Jersey. He has also set choreography for South Jersey Wind Ensemble and the Wax Works Dance Festival in NYC. He also works at an adjudicator for various dance competitions throughout the country. Healani Harper began her classical ballet training at Atlantic Contemporary Ballet Theatre. After graduating early from the Atlantic Contemporary Ballet Theatre’s academic program where she earned dance credits from The Richard Stockton College of New Jersey. She also became a resident instructor at ACBT and joined the school’s parent company--the Atlantic City Ballet. She is a former Montessori instructor and a recently graduated Drexel University with 4.0. Healani is thrilled to be combining her two passions of dance and working with young kids as the Pre-K and Kinder-dance Director at TLC! ​Born and raised in Cape May, New Jersey Michelle Muentz graduated from ChARTer Tech Performing Arts High School in 2006. After High School Michelle studied Dance Performance while attending Ventura College in Ventura, CA. Later Michelle received her Associates Degree from Atlantic Cape Community College in Mays Landing, NJ. More recently Michelle has decided to further her studies at Stockton University. Dance has been a part of Michelle's life since the young age of 3. Over the years she loved studying all genres of Dance but primarily focused on Jazz, Hip-Hop, Modern and Dance Performance. Michelle is also a Certified Zumba Instructor. She currently teaches at Miracles Fitness in Rio Grande, New Jersey. Her passion for Dance shines through her teaching methods. When Michelle isn't dancing, she works as a Cosmetologist at MerMade Children's Spa in West Cape May, a Makeup Artist at Shear Sunsations in Cape May, and she volunteers at her Church, Revolve in North Cape May. Phil began his tap training at a very young age. As his love for the art grew, he expanded to other styles, being consistently recognized for his hard work and determination to perfect his craft. 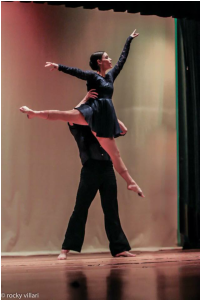 When his high school and dance competition days were up, he made the decision to pursue dance as a career and enrolled in Towson University's dance performance B.F.A. Program, with scholarship. After completing a year at Towson, he attended a summer intensive, training under the Artistic Director of the Atlantic City Ballet, Phyllis Papa. He spent the next year performing with ACB as a trainee, before being promoted to apprentice in 2014. Mr Pagano continues to perform with ACB as well as guest performances across New Jersey. He currently teaches and choreographs tap, jazz, ballet and more for many dance studios in the area. He hopes to instill future dancers with a strong work ethic and a love for performing for life. Tullio’s dancing career began at the age of 12 at “Centri Studi Musical” in Rome, Italy under the direction of Ranko Yokoyama, principal dancer of “Louis Falco Dance Company” and Lucia Colognato Principal dancer of “Opera di Roma”. From there he went on to study at the Accademia Nazionale Di Danza(Rome) and in 2011 he joined the American Repertory Ballet Trainee Program in Princeton, NJ where he completed his technique training with teachers such as Maria Youskevitch and Kathleen Moore and had the chance to dance company repertoire like Viva Vivaldi(Gerald Arpino) and George in Our Town (P.Jerry). After joining the Atlantic City Ballet in 2014 he had the change to dance several roles such as Cavalier in The Nutcracker, originating the role of Christian in Moulin Rouge, Demetrius in Midsummer Night Dream, Prince Sigfried in Swan Lake , Prince Florimund in Sleeping Beauty and many other like Drums, Tango, Clear Water, Mountain Legend, Dracula and Come Join the Dance. Heather has been dancing for her whole life and is extensively trained in ballet, pointe, jazz, modern, and tap. She began dancing at Little Theater Workshop in Toms, River, NJ. She competed in multiple dance competitions and won many gold medals. She also trained at In Step Dance Center, in Island Heights, NJ. She graduated as a dance major from the Southern New Jersey Academy of the Performing Arts. She danced as Tiny Tim in the Christmas Carol and as Young Bell in Beauty & the Beast. Her performances in The Nutcracker with the Atlantic Contemporary Ballet Theatre include Clara, Chinese, Marzipan, Snow Princess and Flower Princess. She has been featured in many other ballets including Swan Lake and Sleeping Beauty. She has performed in several Municipal First Night celebrations in Toms River, NJ. She performed an outdoor piece on the Boardwalk in Atlantic City with In His Steps. She attended the summer intensive program with the Richmond Ballet in Virginia. She was a guest performer in the Tap Extravaganza in Cape May County. She performed a ballet piece in the 3D Exhibition at Rowan University. Chrissy started taking dance classes at age six and trained and competed in ballet, tap, jazz, modern, and hip hop while growing up in Southeastern Pennsylvania. She performed with the tap group The Jenn Oldfield Dancers and studied hip hop with Rennie Harris, founder and director of Rennie Harris Puremovement and the Illadelph Legends of Hip Hop Festival. Chrissy earned certifications in several dance fitness programs in order to share her love of dance in a format that reached many people who had never been exposed to formal dance training. She is excited to bring her passion for dance and performance to the students of TLC.